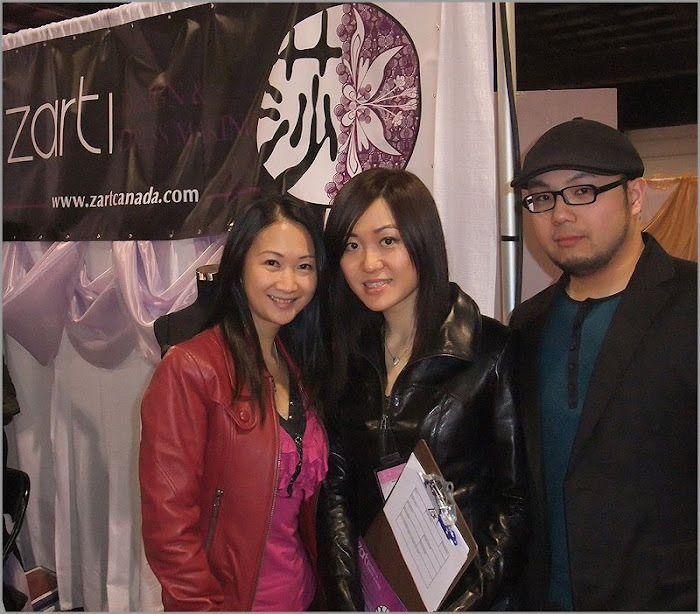 Thanks Atarah and Henry from Zart Design & Dress Making who invited us to partner with them to showcase our work at the Show last weekend (January 21-23, 2011). We are thrilled to meet so many awesome people there. Congratulations to those of you who are getting married or whom your friends are engaged. This is me (left) with Atarah and Henry. We are honoured to witness and capture every detail of Selina and Michael's wedding yesterday. We arrived at Selina's place at 8 in the morning. Her mom and dad greeted us with big smiles and welcomed us with tea. It was busy at the bridal room as Selina, her mom and her maid of honour were getting ready... makeup, harido, etc. Relatives and friends were started showing up after 9. The house was filled with indescribable joy and excitment. Michael finally arrived, joining his bride to the Markham Civic Centre where the ceremony was held. It was a cozy celebration. Families and friends witnessed the union of this sweet couple and sent countless of blessings to the newlyweds. We put together the following video slideshow in the afternoon - our first Same Day Edit slideshow (Yeah!!) - highlighting the preparation and ceremony to share with families and friends at their wedding reception in the evening.